Osha Root Benefits: What Could Osha Root Do for You? Home » Food and Nutrition » Herbal Remedies » What Could Osha Root Do for You? 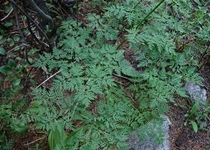 Osha root (Ligusticum porteri) is native to the American Rocky Mountains, and has historically been used as a medicinal herb among Hispanic communities in New Mexico and the southwestern U.S. Native Americans have also used osha root in the treatment of respiratory infections and conditions of the digestive tract and heart. The osha herb is a member of the parsley family known as Apiaceae. Other common names for the root include chuchupate, bear root, and life root. What is osha root used for? It is often considered for its anti-inflammatory and antibacterial properties. This root is quite beneficial for viral infections of the throat and sinuses, and especially for colds or flu. Overall, it is a helpful root for boosting the immune system, alleviating breathing difficulties, and treating digestive issues and conditions associated with pain like arthritis or carpal tunnel syndrome. Osha is an antibacterial and antiviral herb, best known for its ability to soothe a sore throat, treat a cough, and relieve inflammation of the bronchial tubes. For a fever that won’t go away, it could promote sweating and help kick out the flu virus before it has a chance to turn full-blown. In the Southwest, it’s known as “Colorado cough root” and is taken for cough during a respiratory infection. But its effect runs deeper than this moniker. Osha root could relax muscle tissue and prevent any invading bacteria or virus from spreading. Arthritis and carpal tunnel syndrome (CTS) are joint diseases where pain, inflammation, and swelling are common. Arthritis will often affect the elbows, shoulders, ankles, wrists, fingers, and toes. Carpal tunnel, on the other hand, specifically affects the thumb and first three fingers. Osha has a history in traditional Native American medicine for long-term inflammation relief, and may therefore be useful for both arthritis and CTS. The osha herb has long been used to treat painful conditions in folk medicine. This is because osha root acts as a mild anesthetic. As a result, it has often been prescribed as an alternative to painkiller drugs. In particular, consider using osha root to relieve body and muscle aches, headaches, toothaches, and menstruation pain. Osha root tea has been found to treat all sorts of digestive issues, including upset stomach, nausea, vomiting, abdominal pain, cramps, stomach ulcers, and indigestion. Like most bitter herbs, osha root not only soothes digestion, but it also stimulates appetite. One 2015 study indicated that osha root, and its major isolated compound diligustilide, has a clear gastro-protective effect on ethanol-induced gastric lesions. In general, osha root is a great immune system booster. Lymphocytes are an important part of the immune system and a type of white blood cell designed to fight disease and illness. One 2016 study suggests that osha root has a immuno-protective effect against oxidative damage on human peripheral blood lymphocytes. Other research suggests that osha root has immune-boosting abilities in the treatment of acute promyelocytic leukemia—a white blood cell cancer and subtype of acute myeloid leukemia. As you can see, there are many potential osha root benefits that make it an important herb. Other key health benefits of this folk remedy you should know about include its reported ability to treat heart troubles, tuberculosis, hemorrhages, anemia, allergies, emphysema, pneumonia, earaches, and congestion. Osha root is also thought to be an effective anticonvulsant. Osha root is not known to have any dangerous side effects when used in recommended doses. That being said, high doses of osha root taken for long periods of time may cause liver or kidney toxicity. More than six cups daily of osha root tea may also lead to insomnia, diarrhea, appetite loss, headaches, dizziness, and vomiting. In addition, osha root is not recommended for pregnant or breastfeeding women or children under the age of six. This is because the high amounts of oxytocin in osha root may cause problems for both unborn and young children. Pregnant women should also take note that osha root may cause uterine contractions that can result in miscarriages. There are a variety of ways to use the osha herb. For instance, the seeds, leaves, and roots of osha are used to season beans, meat, or chili. You can also boil osha leaves and enjoy them in soups, or you can eat them raw in salads. How do you make osha root tea? Simply steep a handful of osha root in a pot of boiling water. Let the mixture simmer for more than an hour. (The decoction becomes more potent the longer it is allowed to simmer.) Remove the infusion once the color has become a translucent gray-brown. What is the best osha root dosage? The best dosage will depend on several factors, such as the person’s age and the health condition being treated. Please follow the directions on the label or those provided by your herbalist or natural health practitioner. Not many studies have looked into this herb, largely because its use is centered on a specific region of the U.S. and it is believed difficult to cultivate elsewhere—therefore, its longevity in medicine is questionable. But researchers are trying to figure out how to expand osha root’s use. The American Botanical Council has been looking into how feasible it would be to turn osha into an economic crop for Wyoming growers this decade. A step like this may be just what the doctor ordered in bringing attention to this traditional respiratory healer—the same sort of attention Echinacea has enjoyed for some time. “Ligusticum porter (Osha),” The University of Kansas; http://nativeplants.ku.edu/research/ligusticum-osha/about-osha, last accessed July 9, 2018. “Osha Root Benefits,” Herbs for Health; https://www.herbs-for-health.com/osha-root-benefits/, last accessed July 9, 2018. Velazquez-Mayado, J., et al., “Gastroprotective effect of diligustilide isolated from roots of Ligusticum porteri coulter & rose (Apiaceae) on ethanol-induced lesions in rats,” Journal of Ethnopharmacology, Nov. 2015; 174: 403-409, doi: 10.1016/j.jep.2015.08.030. Nguyen, K., et al., “Effects of Ligusticum porteri (Osha) Root Extract on Human Promyelocytic Leukemia Cells,” Pharmacognosy Research, Apr to Jun 2017; 9(2): 156-160, doi: 10.4103/0974-8490.204641. Nguyen, K., et al., “Investigation of the cytotoxicity, antioxidative and immune-modulatory effects of Ligusticum porteri (Osha) root extract on human peripheral blood lymphocytes,” Journal of Integrative Medicine, Nov. 2016; 14(6): 465-472, doi: 10.1016/S2095-4964(16)60280-7. Roulston, D., “Osha Root Benefits [Lovage Effect],” Herbs for Health; https://www.herbs-for-health.com/osha-root-benefits/, last updated January 8, 2018.